Eliminate odors in wetwells produced by long storage periods between pump cycles. Tideflex's lift-out and removable assemblies provide easy access to the diffuser for inspection and removal of accumulated fiberous debris without having to shutdown the wetwell operations. Tideflex Coarse Bubble Diffusers are designed with the Tideflex Check Valve technology which means they can be submerged in solids without clogging. Air supply systems are set to periodically activate to keep the wastewater aerobic and fresh. Mixing cycles prior to pump activation will re-suspend the solids and mix the floatables into a homogeneous solution ready for pumping transfer. Tideflex Check Valves protect stormwater outfalls from surcharging by providing reliable backflow prevention and maximizing upstream storage capacity, due to the Tideflex Check Valve's low cracking pressure. Tideflex Check Valves have saved hundreds of thousands of dollars in potential damage to homes, office buildings and vegetation. Tideflex Check Valves prevent backflow of clean water into the overflow pipes of SSO and CSO systems. When flapgates fail, backflow occurs and treatment plants are forced to treat the clean water because it has combined with sewage. 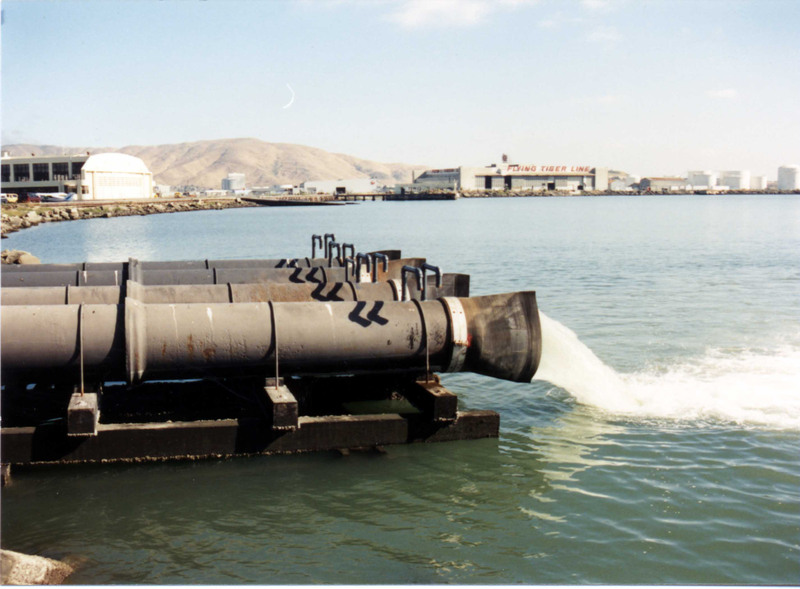 The persistent operational problems with flapgates, and high maintenance costs, resulted in the United States EPA issuing a grant to Red Valve Company in the early 1980s to design and develop an "All Rubber Duckbill Tide Gate" to overcome problems with flapgates. With a multi-year design, development and observation, the EPA reported significant performance improvements over flapgates. Detention ponds provide retention of stormwater and wastewater to prevent flooding and surcharge and often provide some level of treatment. Tideflex Check Valves effectively prevent backflow into these ponds from the receiving water body and/or from adjacent ponds, maximizing storage capacity and preventing the disruption of the treatment process. 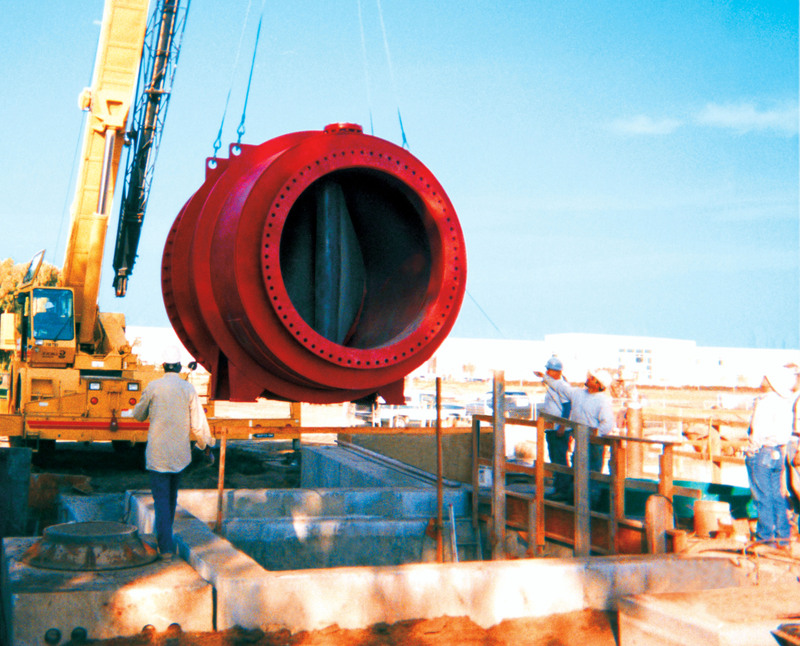 Tideflex Check Valves are also used in conjunction with outlet structures that meter flow to the receiving water body to prevent overloading of nutrients or contaminants. Stormwater and tidal backflow into residential areas, office parks and commercial areas causes flooding that results in property damage, sediment accumulation and traffic flow disruption. Flapgates have historically failed to provide guaranteed backflow prevention and have caused significant damage to the property they were designed to protect. Tideflex Check Valves provide a maintenance free solution through guaranteed backflow prevention. Tideflex Check Valves have also provided access and use for land designated as unusable due to flooding tenancies. 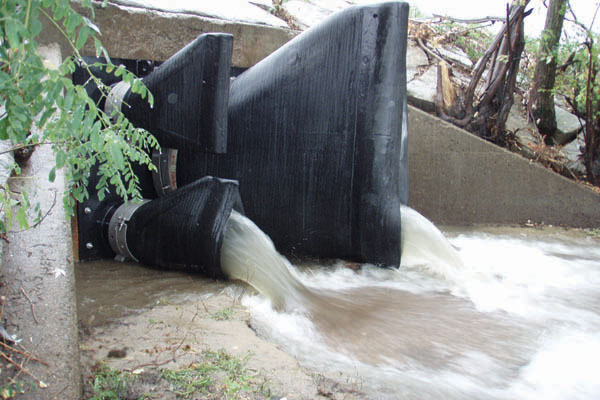 Flood control systems often incorporate multiple high volume / low head pumps in order to discharge large amounts of water rapidly. Although the differential pressure is not great, these systems are often susceptible to backflow during high tides and storm surge. Tideflex Check Valves are integrated into flood control systems due to their low headloss and reliable backflow performance. Tideflex Check Valves are an ideal component of floatables control projects because of their ability to prevent plastic bottles, cans and other material from entering rivers, lakes and streams when water backs up through the discharge lines flooding the screening devices. Tideflex Check Valves are used extensively to protect residential and commercial areas from the migration of odors from stormwater and sewer pipes. P-traps are not feasible in most systems and Tideflex Check Valves have been proven to eliminate the backflow of methane and hydrogen sulfide gases, which often result in complaints about odor from the general public. Tideflex Check Valves have an extremely low cracking pressure and superior sealing characteristics, making them ideally suited for ground water and gas relief of concrete tanks and geomembrane liners. 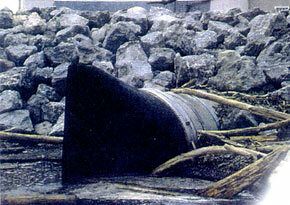 Effective hydrostatic relief prevents liners from floating and prevents damage to concrete structures. Tideflex Check Valves are non-mechanical and will not clog, freeze or corrode. Roads, highways and airport runways that have potential for flooding are protected from backflow of stormwater by Tideflex Check Valves. The low cracking pressure and low headloss characteristics of the duckbill style Tideflex Check Valves ensure rapid discharge of stormwater from roadways and runways. 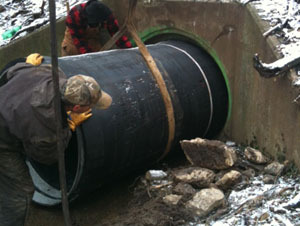 Drainage pipes penetrate levee embankments to allow stormwater runoff relief. 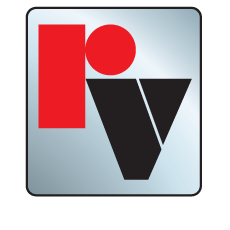 It is crucial to have the reliable backflow prevention capability of Tideflex valves to prevent flooding of residential and commercial areas when the discharge pipe becomes submerged. 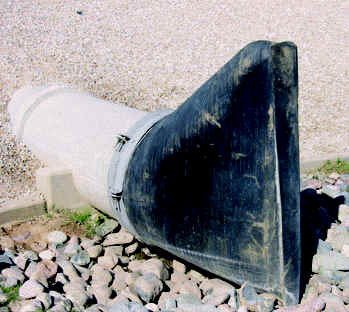 Tideflex valves have low cracking pressure and headloss so that runoff is discharged rapidly and un-constricted. Mammals, rodents and birds can enter unprotected pipes due to curiosity and nesting habits. 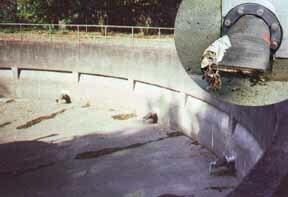 This can result in project delays, blockage of outfall lines, and be detrimental to protected species. 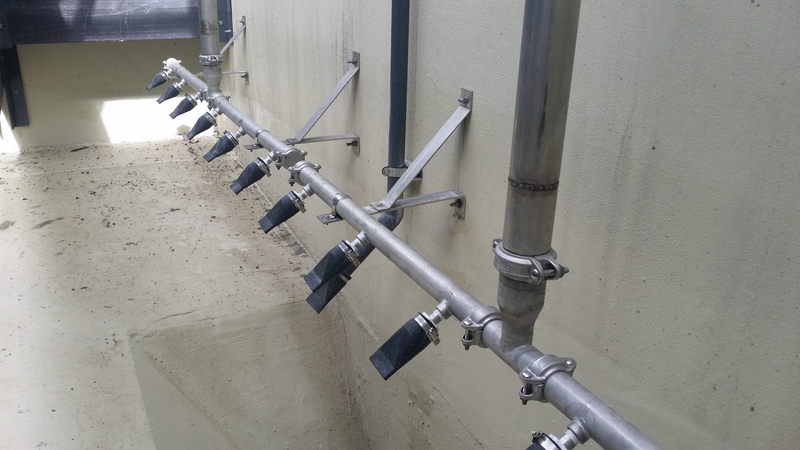 Tideflex Check Valves provide a no maintenance, full proof method of preventing animal intrusion into pipes, even when backflow prevention is not a requirement.